In 2010 The Field Museum began an initiative to collect contemporary urban culture. With 200+ objects in collection, this site captures an ongoing effort to study how Chicagoans consume health and wellness. Explore Chicago's cultural histories by neighborhood. "Placemaking" describes how people reinvent their environments to reflect their cultural and social identities- including the ways they seek health. Studying placemaking allows us to understand how people access heath related products and services in their daily lives. Chicago's neighborhoods have many apothecaries, groceries, herbal stores, gardens, and community centers that encapsulate various heritages and types of health and wellness. Everything you come across in our collection of objects and stories links back to one of these neighborhoods. Home to the American Indian Center and Global Gardens Refugee Training Farm, Albany Park is one of Chicago’s most diverse neighborhoods. Chinatown's stores bustle with activity, from the tinkling of doorway bells to the sound of chatting customers. Home to significant numbers of Orthodox Jews, Armenians, and Indians, Devon has witnessed many waves of immigration. Located on the Southside of Chicago, Englewood is norotious for its high poverty rate, gang violence, and status as a food desert.  Humboldt Park is made up of significant Puerto Rican, Mexican, and Black populations. At Merz Apothecary, Lincoln Square's European roots meld with the story of newer Asian immigrants. Pilsen is a historic neighborhood representing generations of Mexican-American heritage, art, activism, and healing. Chicago’s northernmost neighborhood is a diverse community with its many cultures represented in the businesses and public spaces. The research garden has many plants that have made medical history. You can view objects in the Collections Gallery by their store of purchase, neighborhood of purchase, or the search engine. Recognize an object? Use the comment section to share your knowledge.